I am broken. I lead a community of broken people called a church. And we often say, unapologetically, that we are a community of the broken who have good news for the broken. Don’t misunderstand. I don’t mean that we’re “broken” in the sense that we’re rendered useless by our imperfections. The opposite is actually true. We’re made more useful, and we discover our greatest purpose through our pain and suffering. It is doubtful whether God can bless a man greatly until He has hurt him deeply. And without fail, every time I share it, I get pushback and it usually revolves around the idea that God would never hurt us, right? Isn’t his plan for our lives more along the lines of health, wealth, and prosperity? We tend to think of Christianity as a painless system by which we can escape the penalty of past sins and attain to heaven at last. The flaming desire to be rid of every unholy thing and to put on the likeness of Christ at any cost is not often found among us. We expect to enter the everlasting kingdom of our Father and to sit down around the table with sages, saints and martyrs; and through the grace of God, maybe we shall; yes, maybe we shall. But for the most of us it could prove at first an embarrassing experience. Ours might be the silence of the untried soldier in the presence of the battle-hardened heroes who have fought the fight and won the victory and who have scars to prove that they were present when the battle was joined. The devil, things and people being what they are, it is necessary for God to use the hammer, the file and the furnace in His holy work of preparing a saint for true sainthood. It is doubtful whether God can bless a man greatly until He has hurt him deeply. ~ A. W. Tozer, The Root of the Righteous (p. 165). So it isn’t that God causes evil to come into our lives for no purpose. Rather, it is that he uses the suffering we endure for our good, to prepare and shape our character so that we’re up to the task of leadership. I happen to be a pastor who struggles with depression. And I’m not alone. I’ve spent nearly a decade networking with pastors and church leaders all over the world and I never cease to be surprised at the number who, in private conversation, will divulge their own battles with depression and loneliness. We’re supposed to be strong, right? We have to be the bold leader, the model of victory and spiritual triumph!! But I’ve learned, after two decades in pastoral ministry, that the best leaders are the broken leaders. They’ve been hurt and will be hurt more, and they experience God’s healing. They suffer weakness, and they experience God’s strength. We often have a certain picture of what depression looks like, but many who struggle do so in between all of the working and parenting and the rest of the busyness of life. Charles Spurgeon struggled with periodic depression while growing one of the greatest churches in Europe. He opens the chapter acknowledging that “Fits of depression overcome the most of us.” So again, you’re never alone in your brokenness – it’s more common than you will ever realize. All mental work tends to weary and to depress, for much study is a weariness of the flesh; but ours is more than mental work–it is heart work, the labor of our inmost soul. When at last a long-cherished desire is fulfilled, when God has been glorified greatly by our means, and a great triumph achieved, then we are apt to faint. It might be imagined that amid special favors our soul would soar to heights of ecstasy, and rejoice with joy unspeakable, but it is generally the reverse. The; Lord seldom exposes his warriors to the perils of exultation over victory; he knows that few of them can endure such a test, and therefore dashes their cup with bitterness. In other words, depression often catches us off guard because it follows victory as much as it follows defeat. That tendency to withdraw, to isolate, to allow the negative thoughts to override truth, can be the result of quite natural causes such as a backlash to the adrenaline rush of passionately preaching to a welcoming crowd or a natural imbalance in the chemicals in our brains. When I hear a fellow Christian speak about depression as an issue of spiritual warfare that merely requires more faith and prayer, I always say Yes!!! AND… you should also talk to your doctor about possible physical causes and a counselor about the role of past traumatic experiences. Let’s approach the issue holistically. In other words, sometimes depression can be the result of unconfessed sin. It can also be the result of our circumstances. It may sometimes be satanic oppression. It can simply be the natural low we experience after the emotional high of a victorious moment. And it can also be a physical issue on the same level as diabetes or chronic anemia. Regardless of the cause, here are three huge lessons I’ve had to learn over the last few years. Lesson #1: Denying our brokenness doesn’t work for long. I spent at least a dozen years trying to be the best pastor I could be. I wanted to fit the role, lead well, and if I’m being honest, impress the church and keep everybody happy. So I wore my suit and my smile and tried to do all the pastor things people expect the pastor to do. And when criticism came or when conflict arose, I bottled it away so that I could later use it as an excuse to check out mentally and emotionally from real engagement with people. When Angie and I moved to southern California where I joined the staff as a pastor at Saddleback Church, I was badly broken and I didn’t even know it. Within the first couple of months of life in our new surroundings, various pressures brought my pain to the surface. Our marriage struggled under the weight of it until a couple of breaking points occurred. We joined a small group that embraced us, helped us to finally open up about our issues, and encouraged us in our walk. I also saw our staff counselor, who would provide counseling to any staff member in absolute confidence. Pastor Rick Warren encourages his staff members to seek out counseling without fear or shame, and for the first time, I told a fellow pastor about all of my deepest issues. I’m convinced God moved us to southern California not simply to help Saddleback minister to leaders in the global church, but also because he wanted us to plant a church but knew I wasn’t ready on a spiritual and emotional level. When we started Grace Hills Church, we weren’t perfect or completely healed from all of our hurts, but we were absolutely committed to not faking it anymore. We would start a church as broken leaders, for broken people. It would be a safe place for people to come with their brokenness and find healing and restoration in the good news of Jesus’ death, burial, and resurrection! Denying your brokenness can help you succeed… for a season. But if you want to thrive and become all that God has purposed for you to become, you’ll have to be broken. Lesson #2: There is healing in the cross of Christ. Is it possible for God to instantly and miraculously take away all of your brokenness? Sure. Anything is possible with God. But it isn’t normative. And if you require complete and miraculous healing from God in order to be satisfied with him, you’ll miss out on the joy of coming to know his long, slow process of developing you into Christlike maturity. Remember that Paul received something greater than a miraculous deliverance from his thorn in the flesh. He was privileged to learn through suffering that God’s grace is enough. God works patiently with us, like a master artisan, re-shaping us into the masterpiece he knows we can be so that we can show to others the beauty of what his grace can accomplish. 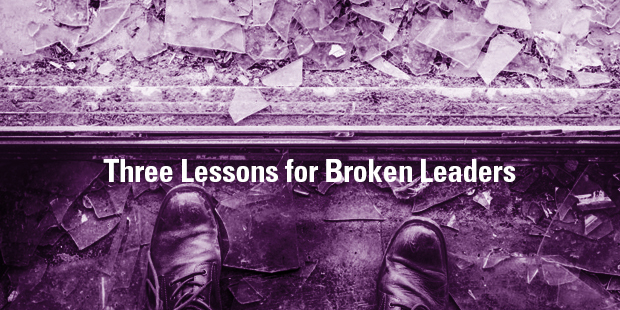 Lesson #3: I lead best when I own my brokenness. The world’s greatest influencers aren’t merely rich and famous. 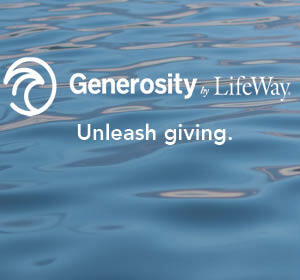 Those who have the most impact on any generation are leaders acquainted with suffering, who own their brokenness. Such mature men as some elderly preachers are, could scarcely have been produced if they had not been emptied from vessel to vessel, and made to see their own emptiness and the vanity of all things round about them. I have a long way to go and a lot to learn. I’m in process, but I’m making progress by the grace of God as I come to understand that it isn’t my strength that brings success or influence. It is actually God’s strength, made perfect in my weaknesses that can profoundly affect the world around me. To any leader reading this, my greatest encouragement would be to embrace your pain. Own your brokenness. And reach out – to your spouse, a mentor, a counselor, or a close friend. Victory comes after our momentary defeats, and though grief lasts through the night, joy comes in the morning!